Tortillas are a tasty, simple and effective food. If you’re down to the essentials and you’re looking for a delicious and practical meal that consists of a few simple ingredients, easy preparation, and quick cooking time than flour tortillas are a winning option. The nice thing about tortillas is that if they are made well, they can stand on their own with a little butter and salt as a savory snack. They also function effectively well in a range of situations. Any variety of leafy or hard vegetables, combined with nearly any protein, grain, sauce or seasoning, tastes better when wrapped tightly in a well made tortilla. Once, when my fridge was empty except for some homemade tortillas and a lonely sprig of lettuce and my cupboard was down to a can of pork and beans, I triumphed by preparing a meal for two of comforting bean burritos. I’m not saying this was the greatest meal I’ve ever prepared. But compared to the sad scene of a lonely plate consisting of beans and a side of lettuce, the burritos were tasty, filling and visually pleasing. In short, the tortillas saved the day. Let me take a moment to clear up any possible confusion. A tortilla can be made with either corn or wheat flour. It is a soft and simple flat bread. When you place some ingredients on top of a tortilla and roll it up you have just created a burrito. The difference between a soft taco and a tortilla is merely one of size and semantics – a soft taco being a smaller tortilla. Of course hard shell tacos are another matter entirely. They will not be discussed in this article for two reasons – because they require a different set of ingredients and preparation and secondly – because it is impossible to eat an entire hard shell taco without having it break apart into thousands of tiny and dangerous taco shards. 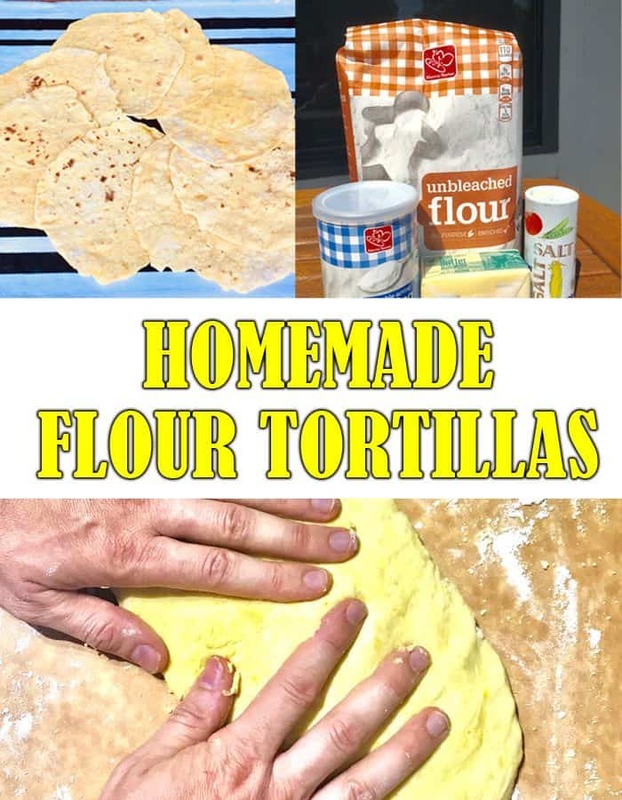 I will be discussing two varieties of homemade flour tortilla in this article. The traditional wheat flour variety and the newer, cutting edge coconut flour tortilla. If you live in Florida or the tropics you know that Coconuts grow on trees and are falling out of the sky all over the place. So why not make use of them? Besides if TSHTF you are going to need to make do with what’s readily and easily available. And as an added bonus, coconut flour is gluten and grain free. So get out your rolling pins and let’s get to work. Here are the ingredients you will need to make 8 traditional tortillas and 8 coconut flour tortillas. 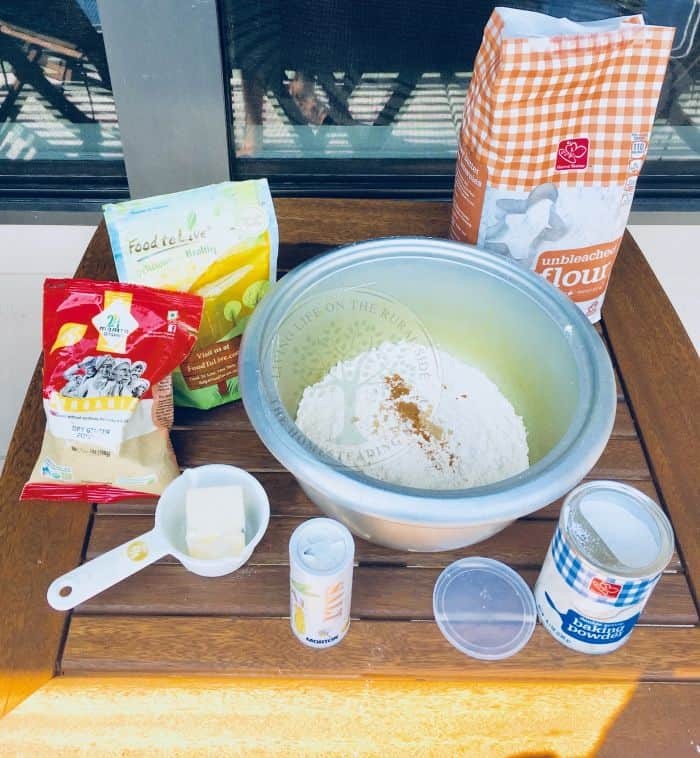 If you are a traditionalist or you think that coconuts should only be used for making Pina Coladas I suggest doubling the number of ingredients for the traditional tortillas so that you will be left with 16 delicious, homemade flour tortillas. Also, as a matter of personal preference I like to add some powdered Turmeric and Ginger to nearly everything I prepare. The ginger adds a dash of zest and flavor and the Turmeric gives off a golden color. There are many ancillary health benefits to Ginger and Turmeric and much has been written and discussed about their healing qualities on alternative health sites. I will simply add that those two ingredients are both flavorful, inexpensive and part of an Ayurvedic medicinal culture going back thousands of years. Of course their addition to the recipe is totally optional. All other ingredients are the same, though you may want to experiment with increasing the amount of butter to help better bind the coconut flour. 1. Go ahead and soften your butter. You can either plan ahead and leave it out of the fridge for a while, or place it in the microwave for ten seconds. If you’re out camping, just place it in a tin by the campfire and it should soften up in no time. 2. 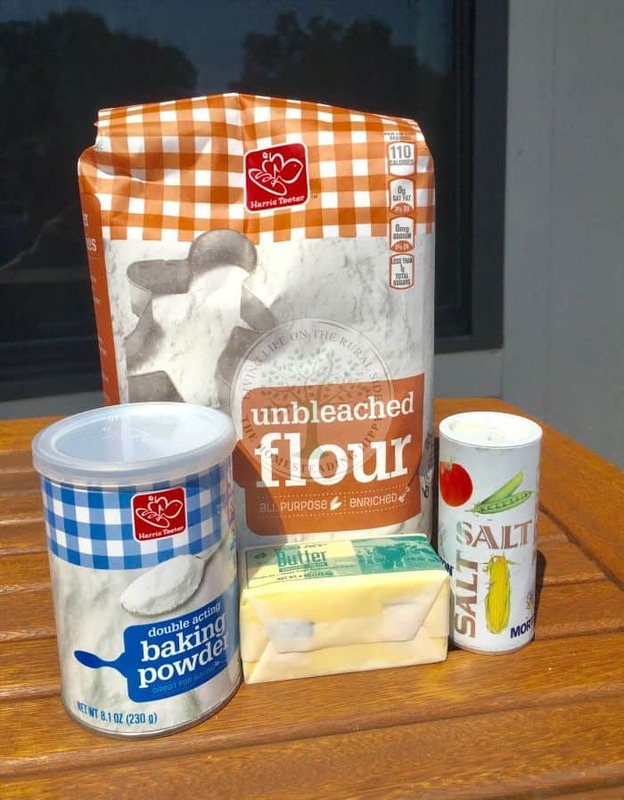 Add the flour, salt, and baking powder to your mixing bowl and whisk it all together. 3. Mix in the softened butter and whisk thoroughly. Some of the flour mixture will gather around the butter and form tiny, dough like crumbs. This is to be expected. 4. Pour in your hot water and stir it into the mixture. The mixture will form into a moist dough but there will still be some dry flour streaks visible. 5. 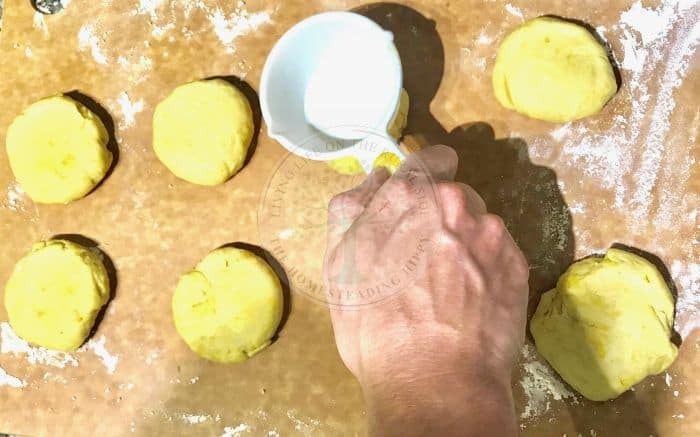 Remove the dough from the mixing bowl and lay it out on a flat, lightly floured surface. Knead it for a minute or two. Take your time if you like. 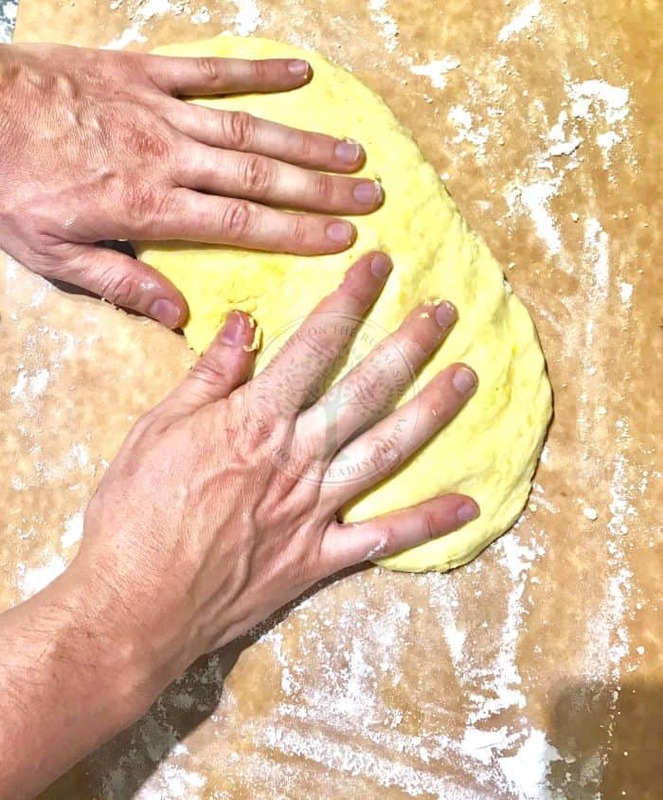 Kneading dough is basically the adult version of playing with play doh. It feels good in your fingers. But don’t overdo it. Now go ahead and form a nice round ball with your dough. If the dough feels very sticky you can add a little flower to it. It should be just barely sticky to the touch. 6. Cut the dough into 8 pieces (I use a spoon for this) and roll each piece into a ball. Flatten each ball somewhat and set it aside. (I like to use the bottom of a measuring cup to push down on them). 7. Cover your 8 balls of dough with a damp kitchen towel and let them sit for a half an hour. This is the easiest step because you literally have to do nothing! But believe it or not, this is the step that people struggle with the most. If you rush this process, the dough will be difficult to roll out, and the fun task of making tortillas will turn into a frustrating chore. If you’re at home, now is a great time to check your emails or read up on the latest survivalist blogs. Perhaps you can check in on a spouse or a loved one who may feel somewhat neglected. Tell them all about the delicious tortillas that are coming their way! If you’re out camping, then gather round the campfire and tell some stories, strum a guitar, and gaze up at the beautiful stars twinkling above you. Isn’t it nice of God to put them there so that you have something sparkly to look at at night. Don’t forget to set the timer! 8. Heat a non-greased skillet over medium heat until hot. You can also use a cast iron griddle. All you need is a piece of metal that conducts heat well and is relatively easy to handle without burning yourself. The short word for that, I suppose, is a skillet. 9. Roll each ball of dough out flat on a flour dusted surface. Roll it out about 7-9 inches or as big as the size of your skillet. For this part I recommend using a wooden rolling pin, but if you’re out camping and you don’t feel like packing additional cookware then feel free to use a maglight. A long maglight with some flour rubbed on the shaft works just as well as a rolling pin. Either way, be sure to rub some flour on the implement so that the dough doesn’t stick. This may seem like a simple concept, but all the best concepts are. Remember, the best things in life are free. But everything else you have to pay for. 10. Gently place the rolled out tortilla dough on the skillet without tearing it. Transporting the rolled out dough onto the skillet is a simple but delicate process. You can use a spatula with some flour dusted on it or you can slide it carefully off the surface and onto the skillet. You can even pick up the dough directly with your bare hands. Whatever you do, just don’t mess this up! 11. Cook the dough for about thirty seconds then flip it to the other side and let it cook for an additional thirty seconds. The tortilla may puff up with little air bubbles and turn golden brown in spots. That is all fine and good. 12. Be careful when removing the tortilla from the skillet not to let it tear. Nobody likes a tortilla with holes poked in it. 13. Let cool and serve. If you want to save your tortillas for later, wrap them in a plastic bag or some aluminum foil and store in the fridge or the cupboard. 14. 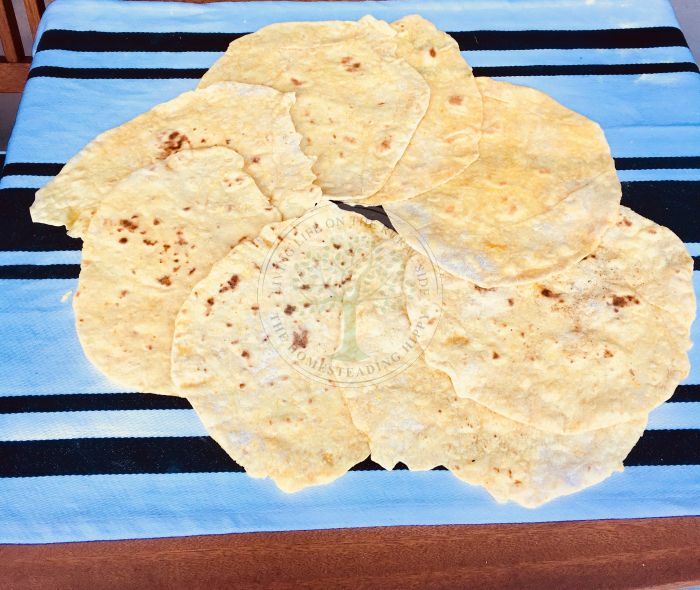 To make homemade Coconut Flour Tortillas – the gluten and grain free option – is easy. Simply repeat steps 1 through 13 but be sure to use less flour and water per the ingredients list. Working with Coconut flour takes practice. The dough may be more watery and have a consistency that resembles pancake batter. So for steps 9 and 10, you can pour the batter directly onto the skillet. Feel free to experiment with the recipe by adding eggs or increasing the amount of butter to thicken the dough. Congratulations, you’ve just created a delicious tortilla from scratch. Not everyone can do this. I hope you enjoy your delicious creations!